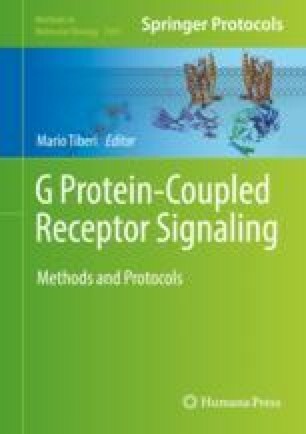 G protein-coupled receptors (GPCRs) contain highly hydrophobic domains that are subject to aggregation when exposed to the crowded environment of the cytoplasm. Many events can lead to protein aggregation such as mutations, endoplasmic reticulum (ER) stress, and misfolding. These processes have been widely known to impact GPCR folding, maturation, and localization. Protein aggregates are transported toward the microtubule-organizing center via dynein to form a large juxta-nuclear structure called the aggresome, and in due course, are then targeted for degradation. Here, we describe a method to study aggregation of GPCRs by fluorescence microscopy. This work was supported by a grant from the Natural Sciences and Engineering Research Council of Canada and by the André-Lussier Research chair to J.-L.P, and by Ph.D. scholarships from NSERC (S.G.) and from the Fonds de Recherche du Québec-Santé (S.G. and J.D.). The authors are grateful to Leonid Volkov for his expertise in confocal microscopy.